First up: the 101 freeway isn’t the easiest to negotiate on the best of days, especially through the downtown Los Angeles interchanges. This weekend is going to be particularly slow as the segment of the 101 between the 10 and the 60 freeways will be closed due to the demolition of the Sixth Street Viaduct. The 101 Slow Jam starts Friday, Feb. 5 at 10 p.m. and will end on Sunday, Feb. 7 at 3 p.m. For specific detour information, visit their page here. Those of you who want to avoid the traffic nightmare should try to avoid the area if possible, bike or take transit. 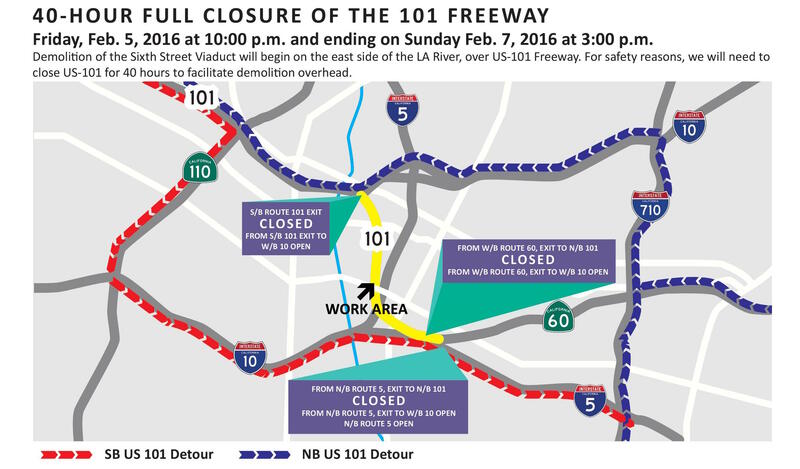 Following the slow jam, the 91 freeway will be closed from the 71 to the 15 starting Friday, Feb. 19, at 9 p.m. until Monday, Feb. 22 at 4 a.m. During that time, Steer Clear of the 91 as crews consolidate several construction activities related to the 91 Project. Metrolink will double its weekend service and provide a “2-for-1” special on both the 91 Line and the Inland Empire-Orange County Line on Saturday, Feb. 20 and Sunday, Feb. 21 to encourage travelers to use the system during the closure. Those with a valid ticket or pass can bring one additional person on the train for free during the closure weekend. Metrolink’s regular weekend service offers two round trips on both the Inland Empire-Orange County Line and the 91 Line. On Feb. 20 and 21, Metrolink will offer two additional round trips on each rail line for a total of 16 trains to assist people avoiding the 91. Metrolink’s North Main Corona Station and West Corona Station will be open during the closure, but Metrolink passengers should allow extra travel time to reach these stations. How We Roll: would the Expo Line have won KPCC’s bike-car-transit race to SaMo? whoa, I might just take the train to Corona! the service is so infrequent I’m usually forced to drive.